Media captionAleksandr the Meerkat gets a surprise mention in the Brexit debate when the prime minister uses his catchphrase. What just happened? "Simples", the prime minister said (yes, actually seeming to quote a meerkat from a TV advert, welcome to 2019 everyone). But, if you are finding it not quite so "simples" to work out what's changed in Westminster today, I don't blame you. Something has changed and, at the same time, not that much has. No 10 believed that they were going to lose a vote in the Commons on Wednesday on a plan put forward by Labour's Yvette Cooper. Under that plan, the government would have been forced to put the brakes on Brexit if their compromise deal with the EU was rejected again by Parliament next month. And, on top of that, it would have given MPs more say over what happens next, designed with the specific aim of giving Parliament a breathing space to pursue consensus for a softer Brexit - a closer relationship with the EU than the PM has agreed. Add to that pressure, a fair number of ministers were willing to resign if Theresa May didn't say, "OK, if the choice is leaving without a deal, or delaying, I'll delay". 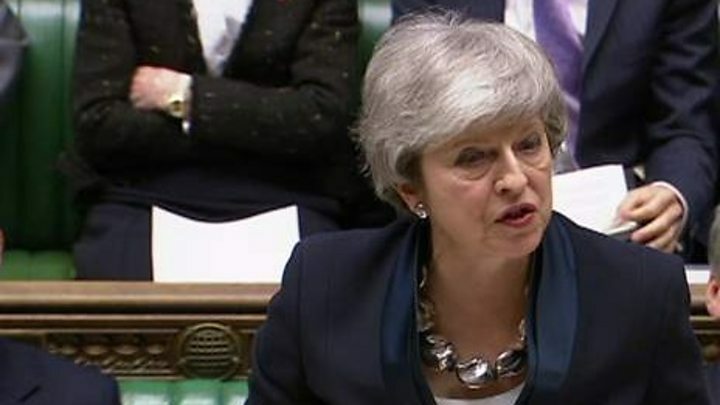 Remember, that's a question that she has avoided for months and months and months, because she regards the promise to leave as planned on 29 March as a solemn one she made to the electorate. And also, because she believed that being willing to walk away without a deal has been an important element of her negotiating stance. As the law stands too, the default is that we leave, whatever happens. But if MPs were going to force her to rule out leaving on time without a deal by trying to change the law, the choice for the prime minister this week was: let the Commons inflict the defeat tomorrow or at least take the decision herself and try to stay in control of events. One cabinet source disappointed with the decision described it as an "unhappy, but maybe necessary" choice. What the Cabinet has therefore agreed to do - with one of those threatening to resign saying "it does the trick for now" - is set out a real showdown in the middle of next month. 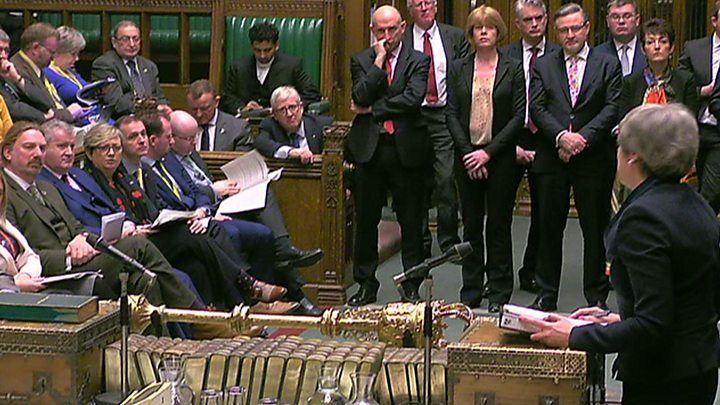 By 12 March - probably on 12 March, depending what goes on with the negotiations in Brussels - MPs will have another chance to vote on the PM's deal with the EU. Remember, last month it was kicked out with a thumping defeat. If the government loses that vote again, the next day, MPs will vote explicitly on whether we should leave the EU without a formal deal or not. The overwhelming expectation is that MPs collectively would say no to departure without a deal. If they did reject that idea, there would be another vote on 14 March. This time it would be on whether or not to extend the process for a short time - to delay Brexit for another couple of months while the government keeps trying to untangle the mess. This is not the same as the prime minister saying that she wants to delay Brexit. She is still insisting that she wants her deal to go through, stick to the timetable and leave at the end of March. But it is, after many months of promising that we'd leave as planned, the first time she has had to acknowledge it might run very late. And because Parliament would almost inevitably reject leaving without a deal at the end of March, it changes the choice for MPs in the next fortnight. No 10 has tried to make the case that MPs will have to choose between the PM's deal, or no deal. Now it's a choice between her deal, no deal, or delay. Her move today does not change the law and make it impossible for us to leave without a deal at any point. There's also a really fundamental question about what an extension would actually achieve, when the government, the EU and MPs have been staring at the same set of problems for more than two years and haven't found a happy solution. The government won't say today what choice they would recommend at the end of March, or what they would do at the end of that extension - leaving with no formal arrangement in place at that point is still a possibility. But today's move does definitely mean one thing - it is now extremely unlikely that we will leave at the end of March without a deal, that much at least is "simples".